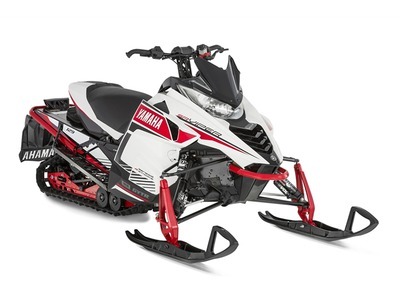 2016 Yamaha SRViper R-TX LE, 2016 Yamaha SRViper R-TX LE The ultimate trail performance SRViper. Features may include: NEW Heated Trail Seat Cut through the chill of a cold winter s day with our high-comfort heated seat, offering low and high heat settings easily toggled by a dash-mounted control. NEW Performance Windscreen The lean and assertive demeanor of the SR Viper R-TX LE is freshened for 2016 with a new performance inspired, color-matched windscreen. NEW Yamaha Performance Damper New and exclusive Yamaha technology, the Performance Damper is designed to improve overall chassis performance by reducing unwanted chassis vibration and distortion. Mounted directly to the chassis at the front and rear of the machine, the Performance Damper harnesses unwanted chassis energy resulting in improved control and comfort with increased high-speed stability and better tracking through rutted and chatter bump filled corners. FOX® FLOAT® 3 EVOL® RC Front Shocks The ultimate FOX® air shock delivers the ultimate in control and performance. The FOX® FLOAT® EVOL® RC combines the goodness of the FLOAT® 3 with a remote chamber touting a wide range of compression and rebound adjustments. The EVOL® chamber is a secondary air spring to control harsh bottoming and minimize unwanted vehicle roll. Dual Shock SR 129 Rear Suspension The drop-link style Dual Shock SR 129 rear suspension is the cumulative result of years of punishment and development in snocross and cross-country competition. The incredibly stout, yet lightweight design allows riders to drive hard into the most demanding and unsuspecting terrain while retaining the utmost level of control. Tuner 2 Skis Our Deep Keel Tuner 2 Skis are engineered specifically for the SRV Chassis and the unique characteristics of the Viper. They deliver reduced ski-pressure and near effortless steering; and the dual keel design delivers an assured bite in the corners with reduced darting. The design also allows you to customize the handling and feel of your sled with easy to change carbide runners in a variety of insert lengths for the inner and outer keel. All Yamaha pictures are kind of Yamaha HD motorcycles picture was taken, including motor fuel gauge, engine, engine mounts, tires, fuel tank, the car handles, lights and so on, 2016 Yamaha SRViper R-TX LE full-screen viewing,2016 Yamaha Motorcycles today Price: $11,900 .